In 2014 ALROSA confirmed its status as the world’s largest supplier of diamonds. ALROSA enterprises extracted 36.2 mn carats of rough diamonds, the Company today accounts for over 25% of the world market. This leading position is the result of many years of consistent work aimed at developing production. In the past year, ALROSA completed an important phase in its development having implemented a program for the construction of underground mines in the Republic of Sakha (Yakutia). In June, the Company put the Udachny underground mine into operation. Whenit reaches its design capacity, the mine will produce 4 million tonnes of ore per year and will be the largest ALROSAunderground mine and one of the largest mines in the world. Udachny is the fourth of the underground mines to be constructed under the ALROSA development program. In the past years, the Company also brought the Aikhal mine to design capacityand put the Mir mine into operation. The program for a transition to underground mining, in which ALROSA investedheavily,will allow the Company to maintain a stable high level of production in Yakutia. In the Arkhangelsk Region ALROSA put the processing facilities into operation allowing the Company to mine and process 4 mntonnesof ore per year at the Lomonosov mine. We can in fact say that a new diamond mining province has appeared on the map of the Russian Federation, as until recently rough diamonds from hardrock deposits were only mined commercially in Yakutia. In 2015,OJSC Severalmaz will begin bringing about 2 mn carats of diamonds per year to ALROSA following the opening of Karpinskogo-1, a new kimberlite pipe, and in the long run production will increase to 5 mn carats. The world rough and polished diamond market situation in 2014 was not stable. Steady growth in the first six months of the yearturned into a decline in demand in the second half of the year. Despite this, sales of rough and polished diamonds by ALROSA in 2014 exceeded the $5 bn mark for the first time in the Company’s history. We were able to achieve such high figures due to aneffectively organized sales system based on long-term contracts. The balanced system of sales to the largest participants oftheglobal rough diamond market is approved by our shareholders and integrated in the Company’s long-term development program.In 2015 ALROSA will begin a new three-year contract period, long-term agreements have been concluded with 47 clients. In 2014 ALROSA paid great attention not only to the organization of sales but also to working together with participants of therough and polished diamonds market. During the year, the Company entered into memoranda of understanding with several keyindustry organizations. These agreements will facilitate information exchange between members of the industry and will help to provide a better understanding of the market conditions. They will also create a platform for working together in protecting themarket from synthetic gems and protecting the reputation of diamonds, on which the long-term demand for our products ultimately depends. Within the framework of implementation of the strategy approved by the shareholders, ALROSA is focusing on the rough diamondmining business and continues to withdraw from noncore assets. In 2014 ALROSA closed large transactions involving the sale of CJSC Irelyakhneft oil producing company and INTERFINANCE financial investment company as well as the public sale of itsinsurance business to SOGAZ Group. In addition, the Company withdrew from participation in the capital of LLC Mediagroup Sitim, Sakha Diamond Corp., CJSC BRINT-M, OJSC Udachny KPP and JSCB SIR. The Company will continue disposing of non-core assets in 2015. In 2014 ALROSA demonstrated steady growth in terms of key operating and financial figures. The Company’s Revenue increased 23% toRUB 207.2 billion, the flow of funds from core activities rose 40% in comparison to the previous reporting year totalling RUB 78billion and in terms of EBITDA profitability (45.3%) OJSC ALROSA is one of the leaders of the Russian mining industry. However, the sharp rise of the dollar exchange rate in 2HY 2014 resulted in the revaluation of foreign currency liabilities, which at theend of the year led to a nominal net loss of RUB 16.8 bn in accordance with IFRS. ALROSA maintains a high level of corporate social responsibility. In 2014, the Company ensured that the salaries increased 8% onaverage in accordance with the Collective agreement, and continued the implementation of all corporate programs, including residential construction, pension, culture, sports and healthcare programs. The programs for local community support andenvironmental protection are being implemented in full. Today ALROSA, with its considerable mineral resource base and major investments in the production, has set itself the strategicobjective of reaching an annual level of production of approximately 41 million carats. As early as in 2015 ALROSA diamond production will reach 38 mn carats due to the increased ore mining volumes at the Mir and Udachny underground mines andthestart of open pit mining at Botuobinskaya and Karpinskogo-1 pipes. Implementation of the strategy of industrial development and withdrawal from non-core assets, efforts to expand the resource base, stable sales marketing and an efficient marketing policy have all contributed to ALROSA consolidating its position on the global rough diamond market. 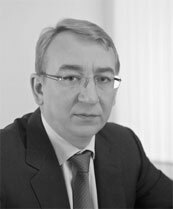 All the good performance indicators that we are proud of today were largely made possible by the great personal contribution ofFyodor Borisovich Andreev, the President of ALROSA, who passed away prematurely. His goal was to make the Company a globalleaderin all aspects. He dreamed that Russia, Yakutia and every employee would be proud of the Company. He was able to do a great deal for the production development and social and economic development of the Republic. We will remember his contributionand build on the good work that Mr Andreev has done. On behalf of the Executive Committee, I sincerely thank the shareholders of the Company, the Governments of the Russian Federationand the Republic of Sakha (Yakutia), the members of the Supervisory Board and all our business partners for their trust and support.